Footgolf is just what the name implies, a mix of Football and Golf. Played on the Gatwick course with an age appropriate football. Footgolf is a game to test your dead-ball power and precision. All you have to do is complete each hole, kicking the football into the oversized cup using your feet, in as few shots as possible. The beauty of the game lies in being able to strategically combine power and precision every time you play. Footgolf is a very accessible sporting activity. It is definitely a lifelong sport, accessed by players in primary schools, right through to the walking football fraternity! Footgolf started out here and this club has also produced most of the UK’s most successful Footgolfers to date. Originally a 9-hole Golf Club we became solely Footgolf in 2012, shortly after this expanding into an 18-hole course. The last few years has seen this exciting, competitive sport grow and become very popular. Footgolf is great fun for everyone that enjoys a game of football – you don’t even have to like golf!. Played in groups of up to 6 players, it’s great fun for colleagues after a tiring day in the office, or something a little different to try with the rest of your football team-mates. 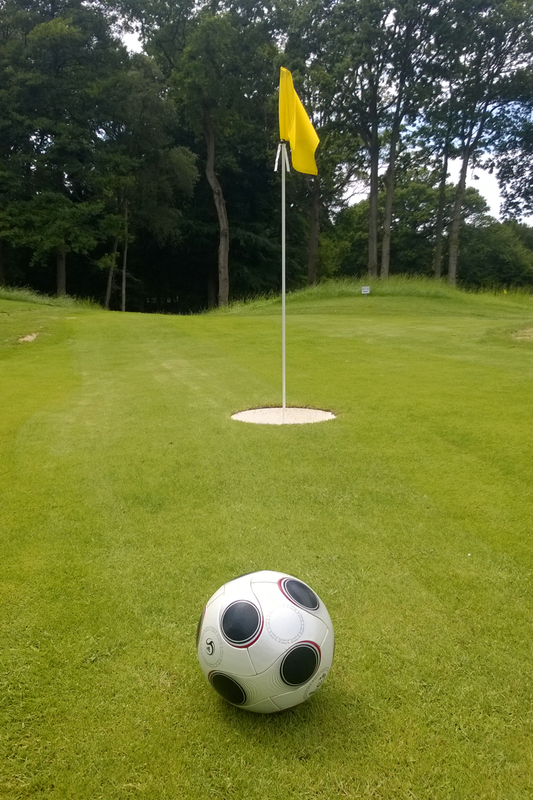 Footgolf is available every day 9am until Dusk, with the last tee-time an hour and a half before dusk. All the equipment you need to play is provided, although you can bring your own football if you prefer. You are welcome to wear your football boots as we are a Footgolf only facility. Footgolf is available every day from 9am. You can just turn up and play, but Footgolf is becoming really popular so booking is advisable. You can book a time, by calling the club house on (01293) 820303. The Game is played for the most part without a referee. The game depends on the integrity of the player to show consideration for other players and to abide by the rules. All players should conduct themselves in a disciplined manner demonstrating courtesy and sportsmanship at all times, regardless of how competitive they may be. Please respect the players and the course at all times. Leave it as you would wish to find it – This is the spirit of the game of Footgolf. The general premise of Footgolf is ‘to kick the ball from the tee markers into the hole in as fewer shots as possible’! Kit/Equipment – any kit or clothing that you are comfortable to play in and Football footwear according to the conditions, so if it is wet bring your boots otherwise AstroTurf trainers are best. Tee off from between or behind (up to 2m) the tee markers. The player farthest from the hole is next to play each time. Play it where it lies, or take ‘a drop’ to where you can play it (but add a penalty shot to your score…). You may mark your ball and lift it if it will hinder another player’s shot. The ball must be played with a ‘single contact’, no scooping or rolling of the ball is allowed. Aim for the red/yellow flags. Do not remove flags from holes. Wait until the ball has come to rest before you take your next shot. Keep up the pace with groups in front, if you fall behind let players pass and ‘play through’. If you ball falls into the water do not try to get it out, we can supply you with a new ball. The drop the ball 2m back from where the ball entered the water. Last tee off at an hour and a half before Dusk. Alcoholic drinks (no glass) may be consumed on the course, all we ask is that it is purchased from the clubhouse and you use the bins provided. Explore Gatwick Footgolf’s massive 18 hole course!